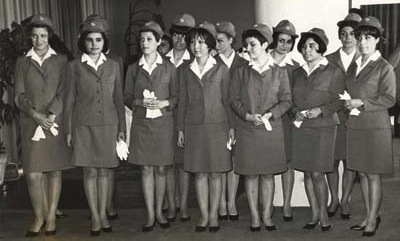 In line with the trend set by Mary Quant of London, Turkish Airlines hostesses' skirts suddenly got shorter in 1968 and, in a extraordinarily bold move, went from sky blue to shocking pink. Those uniforms, which our middle-aged passengers still remember today, were not very practical, but they did fit in perfectly with the spirit of the times by delighting customers with a youthful splash of color. Turkish Airlines in 1989 adopted a red and blue hostess uniform in the form of a suit with either a red jacket and blue skirt or vice-versa. Following these uniforms, which combined the ostentation of red with the dignity of blue, the stark lines of the decade of the nineties began to leave their mark on Turkish Airlines as well. Since 1993 fashions have been more sedate, with hostess uniforms in tones of navy blue and turquoise. No women's legs to be seen in the 2013 THY uniform overhaul. The public has found the new clothing very conservative, stirring controversy on social media channels such as Facebook and Twitter. ... The most-criticized parts of the uniforms are the hats. Some have claimed the hats – along with the whole outfit – are reminiscent of costumes in the Ottoman-era TV serial The Magnificent Century (Muhteşem Yüzyıl). 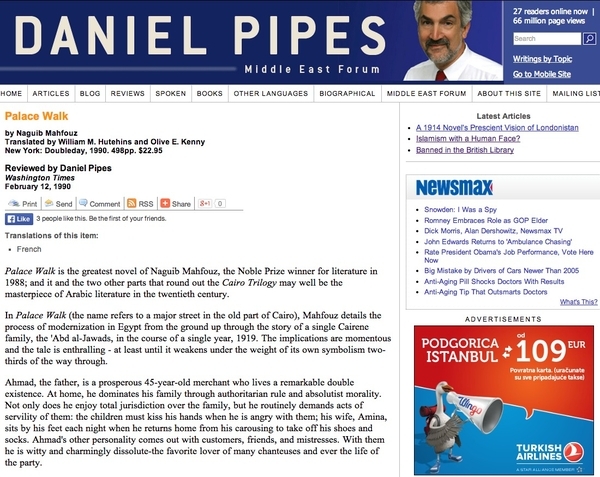 ... Daily Habertürk published comments from other Turkish designers, such as the famous Yıldırım Mayruk, who said Dilek Hanif's designs are nothing but a "joke." Designer Vural Gökçaylı said the clothes do not reflect Turkey. "The clothes look like they belong to Kuwait or Saudi Arabian Airlines. However, they should reflect Turkey and Turkey is not this." The new uniforms have also prompted some jokes at THY's expense. Translation: (voice from the plane") "Could I have permission to land?" (pious controller:) "Horrors! First by God's grace then ours ... Besides, from now on, call this a minaret not a control tower!" (1) Those hats may look like sixteenth-century harem caps to some; to me, they resemble female versions of the fez, outlawed by Atatürk in 1925 and now making a surreptitious comeback. From Dilek Hanif's Spring-Summer 2012 Haute Couture collection. (2) In miniature, this shift in fashion represents the larger imposition of piety throughout Turkish life by Erdoğan and his colleagues or, otherwise put, the reversal of the Atatürk reforms of the 1920s and 1930s. (3) Dilek Hanif, the designer of the new THY uniforms, usually has a much more modern sensibility. The spring-summer 2012 presentation of her work at Maison Chaplin describes it as drawing "inspiration from the 1990s, evoking in her creations the careless spirit, the bold lines, and the joyful vibrations that characterized the fashion. The sophisticated material and colour contrast combines different fabrics and hues, creating sparkling tattoo-like decorations on sensual transparencies, and deep cuts that unveil the skin in elegant, yet seducing silhouettes." Feb. 13, 2013 update: For another aspect of THY, see my new weblog entry, "Alcohol on Turkish Airlines." 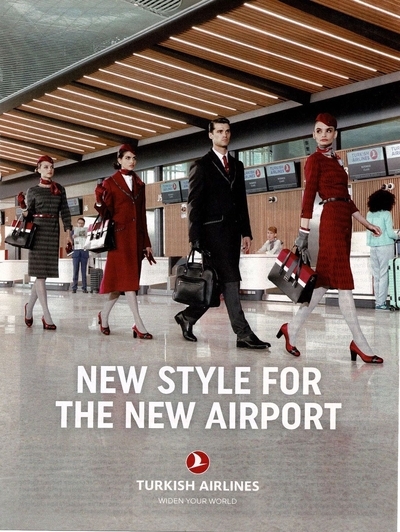 Feb. 13, 2013 update: For a more detailed analysis of the THY fashion fluster, see "New Turkish Airlines Uniform: Eye of the Beholder" by Tulin Daloğlu. Feb. 19, 2013 update: Hamdi Topçu, chairman of the Turkish Airlines board of directors, offers a lame excuse about the fabric of the Hanif uniforms not being right. 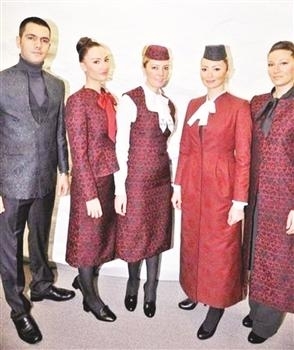 The good news appears to be that the stewardesses will not look like Osmanlı harem chicks. Hamdi Topçu, chairman of the Turkish Airlines board of directors and loyal servant of the state. Feb. 25, 2013 update: A New York Times story on THY's fashion problem, "Turks Debate Modest Dress Set for Takeoff," cites a written statement by Topçu confirming that the airline follows the AKP government's wishes. 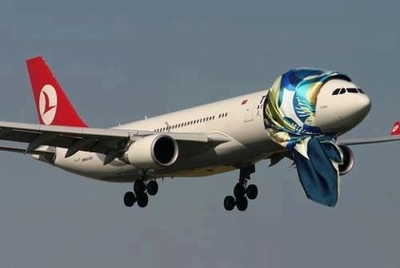 The Turkish Airlines vision matches ... our government's vision. There is no difference between them and us. It is the government that appointed us. The Turkish Republic's government, which came to power with democratic elections and gained the confidence of its people, represents this country's values. Apr. 30, 2013 update: Red, pink, or claret lipstick is the next to go for THY's four thousand female flight attendants, according to a new directive from the Cabin Services Department. Only pastel tones are allowed in makeup. Also prohibited: tattoos, a high bun or wig. May 10, 2013 update: THY has backed down from the red lipstick and presumably the other bans. Nov. 10, 2018 update: An ad in the Economist shows that THY's returned part way to the fashions of old, with high heels, stockings, and a provocative posture. "New Style for the New Airport." The "new airport" refers to Istanbul's gigantic airport that opened on Oct. 29, 2018.